Yes Cat, I felt a great sense of relief that the work had begun again. It’s the rainy season here. Many centimeters fall in a few minutes so I was happy to know that the roof went on over the two classrooms we are trying to complete before I leave. It may even be possible to teach in one of the rooms on Monday as they’re working on the building tomorrow. A curious thing has happened since work recommenced on the school. It has been dry every day and only rained at nights. We said a prayer for dry weather on Wednesday, the director, the builder and myself. Regardless of one’s beliefs it does seem uncanny – because it had been raining every day in the daytime prior to this. Just catching up reading about your time in Cameroon, it sounds amazing and probably life altering. I would like to join you in supporting the project – whats needed? Its great to hear from you. Yes, you’re right, my life has been altered in unexpected ways. Being here has helped me to re-prioritise the things that are important in my life. I’ve also really enjoyed being a classroom teacher again. 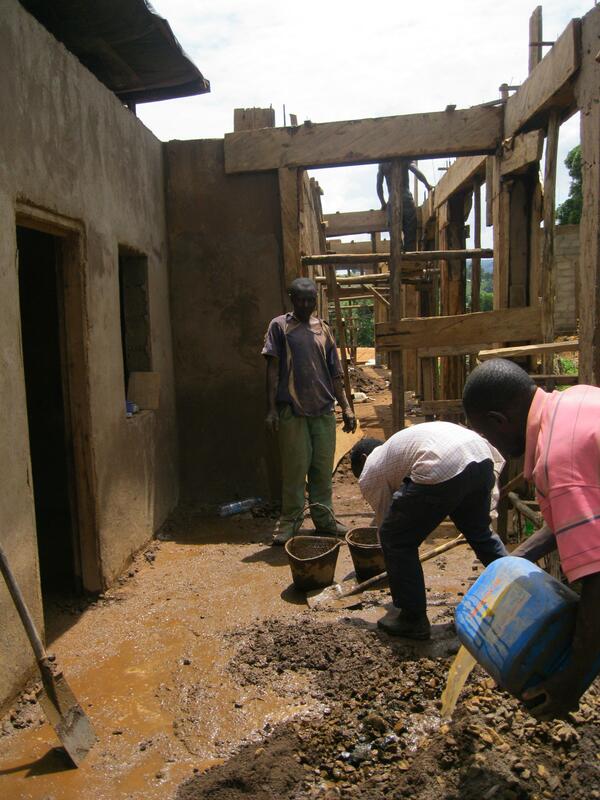 Although the project needs all kinds of educational equipment the most important thing for them at the moment is to get the building finished. Everyone here is working on it. The director, his staff and the children at the school. The donations have been sent to me by Western Union and I’ve passed them on to the project. They are in the process of setting up an account into which international donations can be made directly. Things happen at a much slower pace here than there. I leave on Tuesday morning but will still be able to receive donations and direct them to the project when I return. It may be more appropriate to wait till I get back now before making any donations. I have told the staff here of your offer and they are overwhelmed by the generosity of people they have never met. I’m looking forward to catching up with you when I get back.